We've talked about Celina Ottaway before, and she took over the broom closet-sized kitchen at The Low Beat initially to grow her Celina's Kitchen private chefing and catering business. About a year ago, Josh Coletto passed the brunch baton off to Ottaway, where she continued the Rock N Roll Sunday brunch service for a short time. She has shifted her focus to lunchtime meals recently and her talents shine best on Tuesdays, where she debuts a weekly-changing menu of items that span the globe from Japan to Jamaica to Italy. Ottaway's menu typically includes some version of Parmigiana (cutlets of chicken or eggplant dipped into eggy batters and breadcrumbs before a quick sear) served with tomato sauce and pasta, but the rest of the menu shifts based on seasonality and what is trending with her Celina's Kitchen clientele. 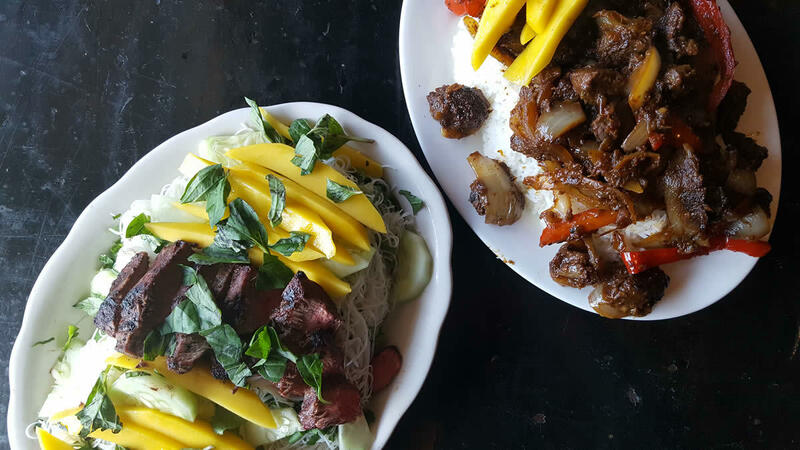 Recently that meant pepper steak and and a deconstructed take on summer rolls with her housemade tropical dressing. 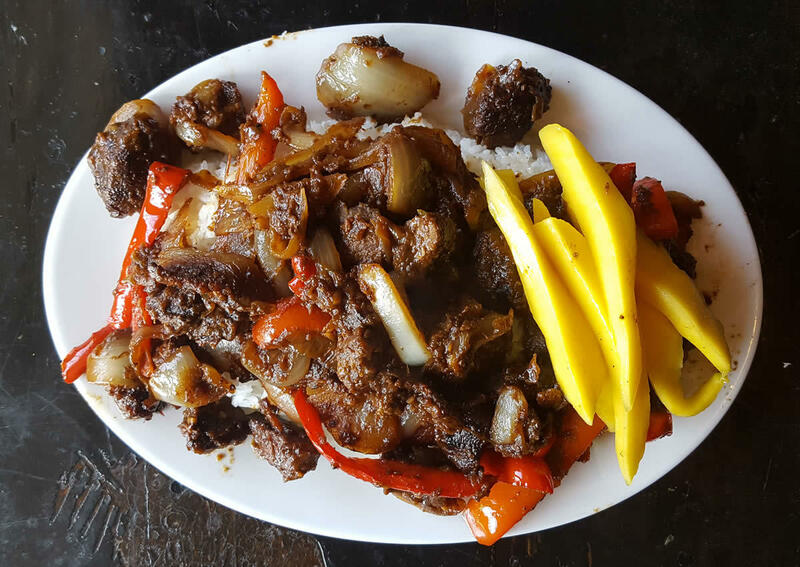 The pepper steak ($12) wasn't your weeknight stir-fry version; instead, Ottaway marinates cubes of stew meat in pineapple juice to impart flavor and slowly deteriorate sinew. The beef becomes fork-tender and the residual sugar from the pineapple caramelizes when the meat is seared in a hot pan. Bell pepper accompanies habanero for balanced heat and onion is cut into a large dice, which allows it to char on the edges while becoming velvety on the inside. 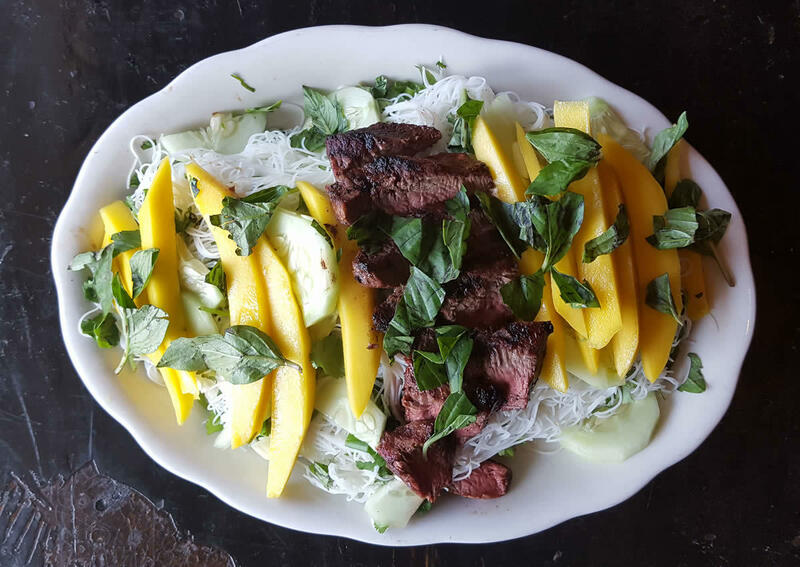 Everything simmers together until the liquid evaporates and it's served over rice with spears of fresh mango for textural and flavor contrast. I had leftovers to bring home. They didn't make it home. I ate the leftovers with my non-driving hand, fingers-to-food-to-mouth, on the 20-minute drive. The summer roll-inspired salad ($12) started on a bed of rice noodles confettied with torn basil leaves and fresh cilantro. Cucumber half moons and mango slices followed, providing a fresh and colorful bed for a substantial portion (I'd guess four ounces) of steak, cooked to a perfect medium. The steak is likely bavette or flap -- that's traditionally considered a lesser cut of meat, but it's jumped in popularity lately as chefs explore its utility. And here it's served in thick planks -- not those sliver-thin slices on most salads that always feel like a rip-off -- giving the meal more of a "steak with a side of salad" feel. It's all topped generously with Ottaway's tropical dressing -- a hit, she says, with private clients -- that relies on the pungent tang and sweetness of pineapple. Is this its own form of urban renewal, or does that term only exist as a gentrified euphemism for brutalist architecture that reaches higher and higher towards the sky until the landscape is nearly unrecognizable? It's not my job to define such terms, but it is my job to tell you how and where to eat: Don't miss out on the eclectic flavors from Celina's Kitchen at The Low Beat. 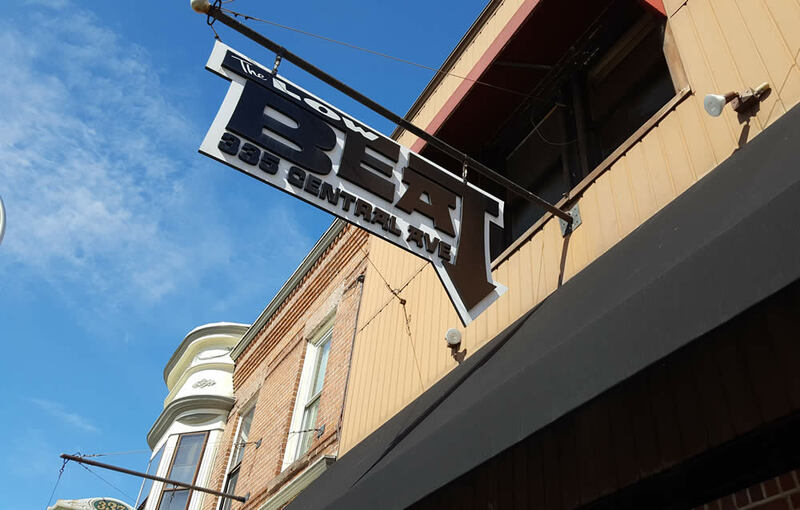 The International Tuesday menu pays homage to what existed on The Low Beat's block long before the club was even a twinkle in Glassman's eye. Celina's Kitchen at The Low Beat is such a treat, I'm glad All Over Albany and Deanna profiled it. Anyone looking for a great lunch spot, head over (especially on a Tuesday). Plus, she is celebrating one year of Celina's Ktichen tonight (Tuesday) at The Low Beat! Here's another endorsement for the food at the Low Beat. Don't let the [beautifully] gritty rock club vibe fool you, Celina puts out well-crafted food. Interesting specials and everything we've had here over our 5 or so visits has been excellent. The "drunken fries" are a must. LOVE the Low Beat. Never ate there.